Well, Ms. Santa has been nice to me once again. I casually mentioned this once upon a time to the wife while at Home Depot and lo and behold I find it under the tree. I love this thing! Works great, no complaints. Yes I have used the snot out of it already. I really like the edge sander the best. Congratulations on your new tool. I have had one of these for some time and I consider it one of the true bargains in the bargain tool categories. You will love it… I’ve had mine for several years and it is a great tool. danoaz, I have the same problem, but I will figure it out, maybe store it under the work bench? 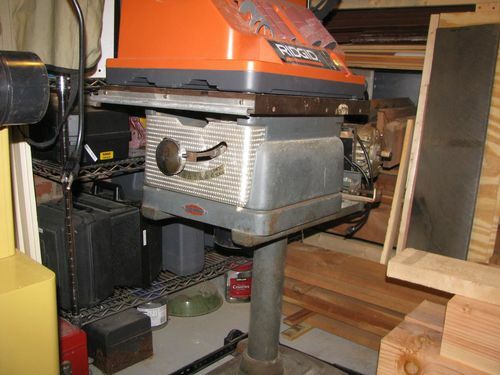 I also have this machine. It works great. It is light enough to put on a shelf. Not easy but even an old fart like me can handle it. i’ve got the same and its been a blessing to have.indeed it does look like you’ve been a good boy!!!! Make yourself a dedicated cart, and you have a real sanding workhorse. As well as general sanding tasks, I like to use the belt attachment with a miter gauge to chamfer the ends of tenons. Works great. Nice cart, I like that! but do I have room for the cart? LOL! 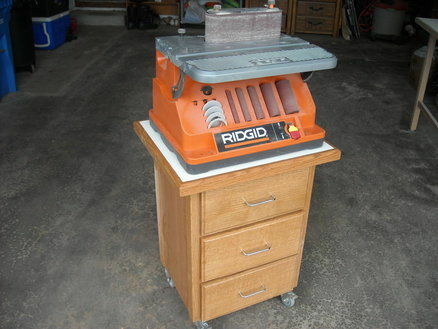 I’m with Richard, this machine has to be one of the best values in woodworking. Thanks for the review. I really want this machine. I have one for over 3 years and it works great. I agree.its probably one of the most used tool in my shop. Its been on my short list (you know, the long short list) for a while too. Thanks for the review and congrats! I have this unit as well and it’s worth it. As for a stand, I’m a bit of a retro grouch so my C’Man table saw is the same base size as the sander and the sander is light weight so voila two in the same space as one!